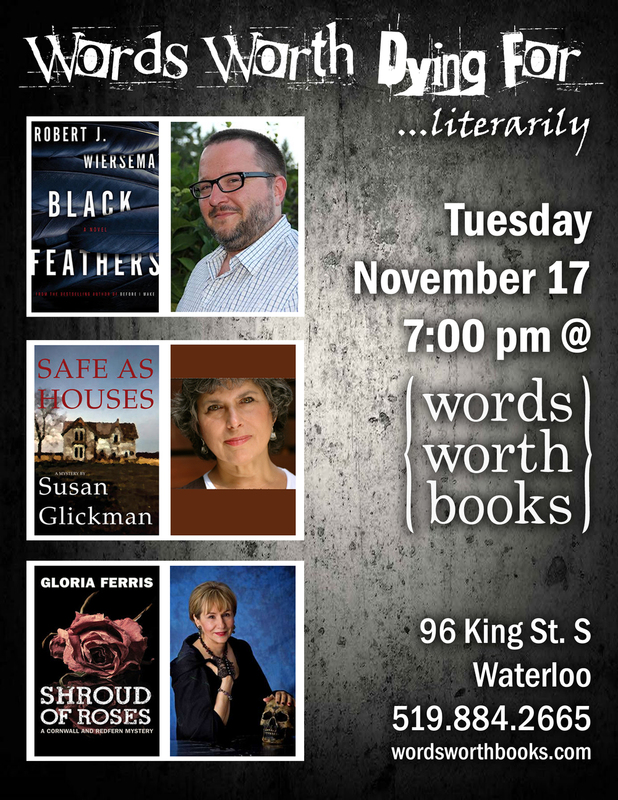 Join us on Tuesday, November 17 at 7pm here at Words Worth Books for an evening of top-notch thrills from three of Canada's finest writers. ROBERT J. WIERSEMA is a writer of fiction and non-fiction and a reviewer who contributes regularly to several national newspapers. He is the best-selling author of two novels: Before I Wake and Bedtime Story and a non-fiction book about Bruce Springsteen, Walk Like a Man. He lives in Victoria, British Columbia. His latest novel, BLACK FEATHERS, is a gripping, genre-bending novel from a master storyteller. Sixteen-year-old runaway Cassie Weathers is utterly alone, living on the streets of Victoria as winter sets in. She meets Skylark, a girl who draws her into a community of street dwellers, a rag tag group led by the charismatic Brother Paul. Cassie begins to find friendship and a tentative sense of belonging within the group, though everyone is on edge when the city is rocked by the news that a number of young prostitutes have been murdered. Cassie is haunted by dreams and the secrets that she fled from at home. What is real from her past and what exists only in her night terrors? How did the darkness of her dreams slip into her life back then, and why does it seem to be happening again? Under the spectre of a serial killer and questioning her own violent nature, Cassie spirals into complex dreamworlds where her past blurs with her present and nothing can be trusted. Reminiscent of the works of Stephen King, Charles de Lint and Neil Gaiman, Black Feathers is a mythic thriller that carries you in its grip right until its heart-stopping conclusion. SUSAN GLICKMAN is a novelist, poet, critic, and teacher. Her previous fiction includes The Violin Lover (2006), which won the Martin and Beatrice Fischer Prize in Fiction of the Canadian Jewish Book Awards. She lives in Toronto, where she teaches creative writing at Ryerson University and the University of Toronto and works as a freelance editor. She will be reading from her new book, SAFE AS HOUSES. Liz Ryerson believes that Hillcrest Village, her Toronto neighbourhood, is quaint and quiet, but stumbling over a corpse while walking her dog dissolves that illusion for good. When she realizes that she actually knew the dead man, a real estate broker who appraised the building she co-owns with her philandering ex-husband, she becomes obsessed with solving the crime. The more instability is revealed in her life, the more she needs to find out who killed James Scott - and why. Retired Classics professor Maxime Bertrand is delighted to play Watson to her Holmes. For Liz, the investigation is a way of asserting control in a world she no longer recognizes. It is also a means of proving to herself and her children she is not in retreat from life but can grow and change. For Maxime, it's a way of becoming re-engaged in life after his wife's death. Neither of them anticipates the possibility of real danger, despite police warning them to stop meddling in criminal matters. In Safe as Houses, novelist Susan Glickman explores her own Toronto neighbourhood, imagining how a confrontation with murder might peel away its veneer of security and civility. She also shows, through her warm, witty and wise depiction of everyday life, what is worth saving. GLORIA FERRIS is a former technical writer who now writes mysteries, both paranormal and humorous. Her first novel in the Cornwall and Redfern series, Corpse Flower, won the Unhanged Arthur Ellis Award in 2010, and her first novel, Cheat the Hangman, won the 2012 Bony Blithe Award. She'll be reading from the newest installment in the series, SHROUD OF ROSES. The Class of 2000 held one final party in the old gym before the high school was abandoned and boarded up. At midnight, the school emptied for the last time. Or so everyone believed. Fifteen years later, the building is scheduled for demolition. When a salvage team discovers a skeleton curled up in a locker, a hole in the left temple, Lockport’s chief of police, Neil Redfern, is called in to investigate. When Redfern learns that his girlfriend, Bliss Moonbeam Cornwall, also graduated that fateful year, he reveals details of the grisly discovery. She insists she knows who his victim is, but before any headway can be made in the case, another grad is killed. Could the two murders be connected? Despite being warned against meddling in police affairs, Bliss enlists the help of two former classmates to find the killer. But digging into the past proves to be a dangerous pastime. Her unconventional methods jeopardize the investigation, her relationship with Redfern, and her own life.